A house fire. A suspicious death. A serial killer to catch. When a body is found in a house fire DS Peter Gayle is called to the scene. It looks like an accidental death, but the evidence just doesn't add up. With only one murder victim they can't make any calls, but it looks like a serial killer is operating in Exeter and it's up to Pete to track him down. But with his wife still desperate for news on their missing son and his boss watching his every move, the pressure is on for Pete to bring the murderer to justice before it is too late. A few years ago, I attended, with a small group of friends, a production of Christopher Fry's The Dark is Light Enough. The Countess was played by an exceptionally able and excellent actress (Elizabeth Officer) and the overall production was extremely impressive and thought provoking. I recall that upon leaving the theater each member of the party expressed the feeling that a profound emotional experience had been lived. A few minutes later, over refreshments, we began the inevitable critical attempt at explaining exactly what had happened to produce this cathartic effect. A strange thing happened: the emotional and intellectual complexity of the experience began to disappear as the critical attempt at understanding it progressed. Each member of the group became more and more interested in impressing the others with his acuteness of perception, with his ability to compare and contrast the work we had just experienced with possible sources, trends, philosophical ideas, and as a representative work of theater, etc. Each was using the play as a springboard from which to begin his own dialogue concerning the nature of art and the nature of life. Interesting discussions? Yes. Important to an understanding of the play? Probably. Valuable to the experience of the play? No. It became more and more apparent that the whole (the experience of the play) was not to be divided into segments, discussed, distorted and then reassembled. The critical (amateurish perhaps, but no different in kind from any critical study) dissection was interesting in and for itself, could be judged on the basis of its own internal consistencies and depth of insight, but was, finally, completely divorced from the total effect of the play, and in fact tended to destroy the wholeness of the experience produced by the play. Critical theories grow from the same soil as did this remembered discussion. unchanging and ordered as compared to the experiences of life which are so often flowing, ephemeral, unordered, and meaningless. Kenneth Burke, for example, who is undoubtedly, a brilliant, vibrant, vital and concerned critic, has produced several books which are insightful, interesting, sometimes brilliant works in which he constantly suggests that human relations should be analyzed with respect to the leads discovered by a study of drama. His basic interests are not in literature but rather in producing a theoretical terminology which will handle any written work, be it drama, philosophy, poem, novel or Time magazine. As Aristotle had his six elements of tragedy (plot as act, character as agent, thought as purpose, melody and diction as agency, and spectacle as scene); as Ben Jonson had his "poem poesy and poet"; as Emerson had his "cause, operation, and effect"; as Ferguson had his "purpose, passion, and perception"; so Burke has his pentad of the five key terms of dramatism: act, scene, agent, agency, purpose, which are offered as tools to discover "the basic forms of thought which, in accordance with the nature of the world as all men necessarily experience it, are exemplified in the attributing of motives". His book Grammar of Motives is dedicated to showing how these five terms can unlock the motivational and purposive reasons and meanings in "metaphysical structures, in legal judgements, in poetry and fiction, in political and scientific works, in news and in bits of gossip offered at random". He does a brilliant job of applying his terms to a vast number of writings including philosophers, poets and legislators. Mystery novels also follow a pattern. We need a detective, either private or a police detective, to wrestle with the clues that are presented - and to solve the case. We require conflict, both internal and external – the troubled protagonist working in a troubled setting. And a clever protagonist faced with a serious crime or series of crimes. 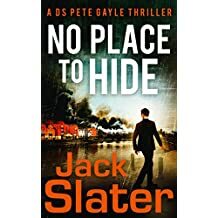 This new novel by Jack Slater has all of the above. Detective Sergeant Pete Gayle is in charge of a team of investigators and has an on-going conflict at home and at work. At home his son is missing and his wife is suffering from depression from the absence of the son. At work his superior is a person who will do anything to advance up the ladder within the organization. The stress is palpable. And now he has a new case to solve. A body turns up in what initially looks to be an accidental death. But Pete is not at all satisfied that it is an accident. Forensic evidence bears him out. More bodies turn up. A serial killer at loose in Exeter? Searching for clues in the midst of the stress of searching for his son adds to the tense atmosphere that permeates the case. The team works well together – the interaction among the members is natural and interesting and together they will solve this horrendous series of crimes. An exciting, readable, and enjoyable novel.